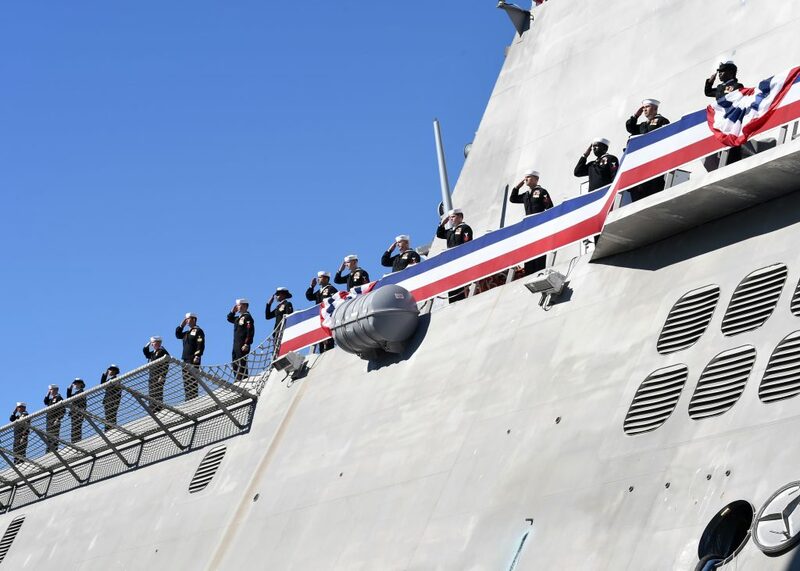 SAN DIEGO (Feb. 3, 2018) – The littoral combat ship USS Omaha (LCS 12) became the newest member of the Navy’s surface fleet after being placed in commission during a ceremony at San Diego’s downtown Broadway Pier, Feb. 3. The new Independence variant littoral combat ship is the Navy’s fourth vessel named in honor of the patriotic, hard-working citizens of Omaha, Nebraska for their support of and contributions to the military. Susan “Susie” Buffett, the ship’s sponsor, is a known philanthropist in Omaha, Nebraska and the daughter of Warren Buffett. Susie gave the order for ship’s crew to “man this ship and bring her to life,” signaling 69 Sailors to run aboard the ship and officially begin its life. As part of bringing the ship to life, one of the crew’s hard working Sailors, Boatswains Mate 2nd Class Jamila Smith, of Brooklyn, New York, broke the ship’s commissioning pennant and the flag of the Secretary of the Navy. Many attendees said they were honored and deeply moved to be able to bear witness to such a momentous event and time honored naval traditions. Omaha, the 11th littoral combat ship and sixth Independence variant, is now homeported in San Diego with fellow littoral combat ships; USS Freedom (LCS 1), USS Independence (LCS 2), USS Fort Worth (LCS 3), USS Coronado (LCS 4), USS Jackson (LCS 6), USS Montgomery (LCS 8), and USS Gabrielle Giffords (LCS 10). Three additional LCS are homeported in Mayport, Florida. LCS is a high speed, agile, shallow draft, mission-focused surface combatant designed for operations in the littoral environment, yet fully capable of open ocean operations. As part of the surface fleet, LCS has the ability to counter and outpace evolving threats independently or within a network of surface combatants. Paired with advanced sonar and mine hunting capabilities, LCS provides a major contribution, as well as a more diverse set of options to commanders, across the spectrum of operations. The LCS-class consists of the Freedom-variant and Independence-variant, designed and built by two industry teams. The Freedom-variant team is led by Lockheed Martin (for the odd-numbered ships, e.g. LCS 1). The Independence-variant team is led by Austal USA (for LCS 6 and follow-on even-numbered ships). Twenty-nine LCS ships have been awarded to date: 11 have been delivered to the Navy, 15 are in various stages of construction and three are in pre-production states. This entry was posted in Commissionings and tagged commissionings, uss omaha. Bookmark the permalink.